I am fascinated by complex phenomena that emerge from very simple processes. This is the underlying behavior of the natural world, and vivid examples can be found at every scale. Biology emerges from chemistry. The experience of consciousness emerges from the accumulation of neural activity. The myriad activities and complex behaviors observed in ant colonies, and even human cities, are simply the product of the accumulation of the myopic actions of individuals within those societies. Unbounded, my installation at Rice Gallery, is essentially a distillation of this idea. Simple and predictable units are accumulated until an unexpectedly rich range of physical and visual phenomena result. My work rarely begins with drawings or preconceived images. I tend to approach materials directly, playing for an extended period, and discovering previously unforeseen possibilities for a system of construction. That system then dictates the form, and that form is necessarily more interesting than any preconception I might have conjured from the beginning. In the case of Unbounded, I began with poplar sticks. I was drawn to poplar because of its abundance, low cost, and its exceptional malleability. All of these factors allow for freedom of process, as I could easily generate a seemingly endless supply of materials. The hand-pegged, three-dimensional cubic grid is something that evolved in my studio over years of contemplating and playing with these sticks. 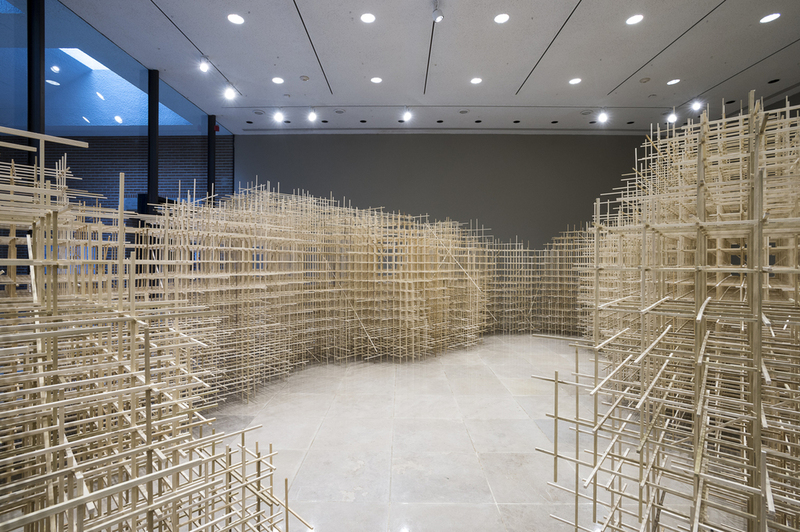 Previous works utilized the grid, but the space of Rice Gallery allowed for a large-scale exploration of the potential of this unit. 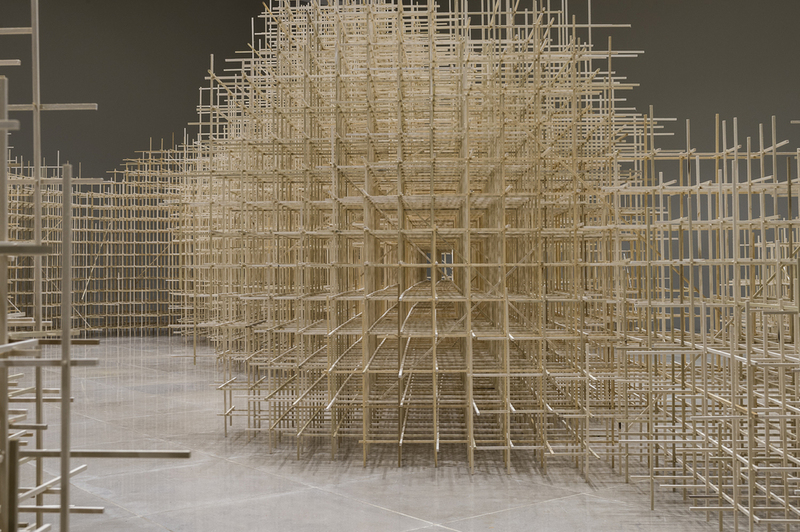 This installation began with roughly 10,000 sticks, hand-cut on a table saw from a small truckload of boards. These sticks were assembled into grids in my studio in Memphis on a large jig that ensured precise registration. While the grid is standardized, the silhouette of each two-dimensional layer is not. The grids were made by hand with matchsticks tapped into drilled holes to join the sticks together. These randomly shaped flat sheets, about 300 of them, were then brought to the gallery where we began configuring them, adding more sticks horizontally to complete the three-dimensional grid. Diagonals were added only as needed for structural integrity. The form grew organically as layers were added intuitively in response to the space. I am primarily concerned with the visual and spatial experience of the viewer, the particulars of how one moves through the space and explores its nuances. And so the final step in constructing the piece is to subtly manipulate the form by means of editing, like pruning a giant bonsai. Bonsai, along with traditional Japanese stone gardens and Chinese scholars’ rocks, have always intrigued me in their prioritizing of negative space. The holes in stones, the spacing of objects in a garden, and the act of pruning all emphasize how the adjustment of positive form can be a means of manipulating the negative. This concept was at the forefront of my mind while developing Unbounded. Yes, it is an object, undeniably hand-built through a complex additive process, but that process is entirely in the service of another motive: to manipulate space and our perception of it. I am interested in the voids, those between the sticks as well as those larger voids in which the viewer moves. One void is explored visually and the other physically. 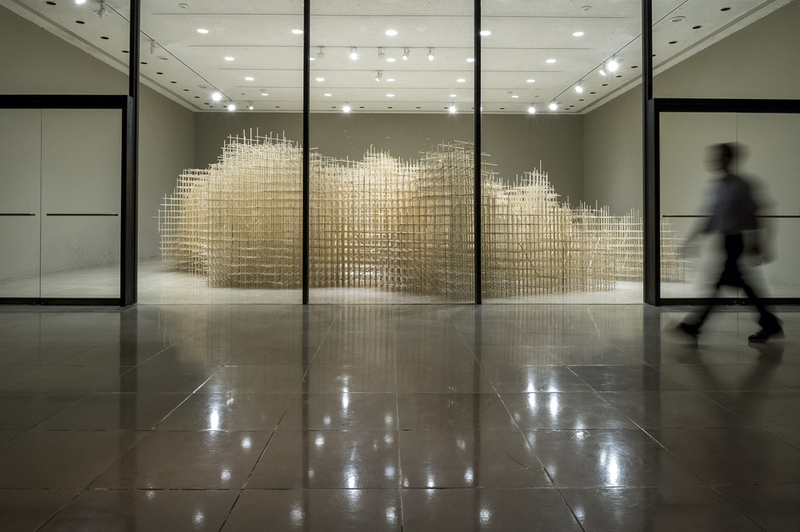 The title of the installation Unbounded alludes to the notion that its form has no defined boundary, that it is untamed and fills the space according to its own logic. I often find that to create an engaging sculpture means to build something that embodies contradictions. On one hand the grid is entirely predictable, constant, and precise; yet the boundary of that grid is seemingly in flux, unpredictable, and alive. 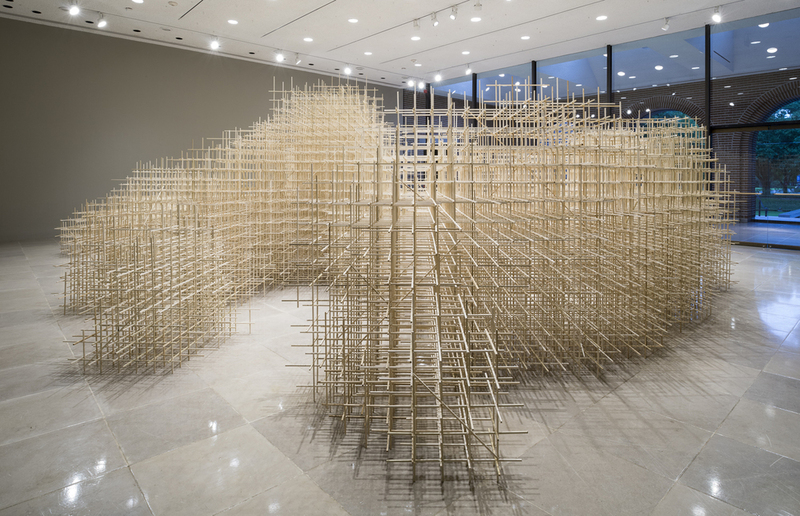 In many ways the piece is architectural, familiar, and distinctly human. In other ways it references the natural world, wild, with no regard for human scale or the attempts of human language to define it. I want to offer a multiplicity of experiences and a sense of discovery as the piece reveals itself over time. It's not politely situated in the center of the gallery, and it is not a thing that you can perceive from one vantage point; rather, it begs to be explored. This installation is site-specific and temporary. All of the materials will be reclaimed when the work is deconstructed. They will return to my studio carrying with them the history of Unbounded and the insights I gained from the experience. They will have a new life, feeding the development and generation of future works. Ben Butler received an MFA in sculpture from the School of Art Institute of Chicago and a BA in visual arts with high honors from Bowdoin College. Butler has also studied at the School of Visual Arts, New York and has completed residencies at ACRE (Artists’ Cooperative Residency and Exhibitions) (2014), the Bemis Center for Contemporary Art (2008), The MacDowell Colony (2004), and the Ucross Foundation (2000), among others. In 2006, he was awarded a Pollock-Krasner Foundation grant. He has had solo exhibitions at Suyama Space, Seattle, Washington and throughout the United States. An upcoming exhibition of his sculptures and drawings at The University of Mississippi Museum, Oxford will open in September 2015. Butler lives and works in Memphis, TN and Quogue, NY.